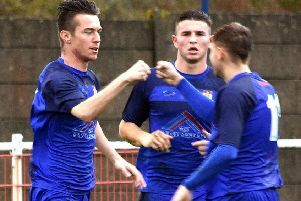 Gate’s slump continued with this fourth successive defeat. 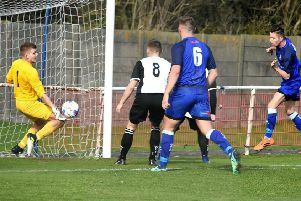 Manager Andy Clarkson welcomed two new signings to the side beaten by West Didsbury as Jamie Thomas, formerly of Bolton Wanderers and Burnley, led the line while James Faiers replaced the unavailable Ben Fletcher in goal for this Hallmark Security League clash. The visitors took the lead after only seven minutes. Joel Brownhill’s shot from the edge of the box was tipped wide by debutant Faiers, who could not prevent an unmarked Brandon Barski heading home at the back post from Brownhill’s corner. Fellow debutant Thomas came close to opening his account on 10 minutes, when he collected Dean Ing’s pass and spotted the keeper off his line but lobbed the ball just over the bar. Ryan Riley sent a testing ball into the Northwich box on 17 minutes but nobody could get a touch. Northwich extended their lead a minute later, when Rob Doran was bought down in the box. Strike partner Brownhill stepped up to double the Greens’ lead from the spot. After a lengthy stoppage in play due to a nasty-looking clash of heads involving Ing, the visitors added a third goal. Ben Reader headed the ball into his own net from a corner to complete the scoring five minutes before half-time. Gate’s best chance to grab a goal back fell to Ryan Riley on 52 minutes. After moving out wide, he flicked the ball over the full-back and into the Vic’s box only to see his strike cannon back off a post. Brett Dawson cut inside as Gate started to get a foothold but shot straight at the keeper. Thomas was next to go close but headed wide from Riley’s ball into the box. Vic went close to adding another goal in the 78th minute. Two players were lurking at the back post hoping to get a touch but the Gate’s cross eluded them. Gate have slipped to 12th but have games in hand on teams around them. Gate: Faiers, Sumner, Richards, Reader, Bamba, Riley, Booth, Ing, Dawson, Seear, Thomas. Subs: Charnley, Mullen, Clarkson, Salthouse.